LEXINGTON, Ky (LEX 18) Teachers are fired up by the governor’s comments about public pensions and education funding. 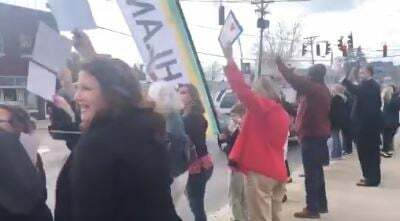 They gathered outside of the Fayette County Public Schools building in Lexington for a rally. In Governor Bevin’s news conference, he vetoed the budget bill, which would include hundreds of millions of dollars of new revenue that would go towards public education. The need for more school funding is one of the reasons teachers and former educators have been passionately rallying at the Capitol and around the state. Senate Bill 151, the pension reform bill, was not the bill vetoed Monday. The Kentucky Education Association released a statement saying that they are profoundly disappointed by the governor’s actions and teachers said they are not giving up the fight.